The city has a well-organised public transport system with an extensive tram and bus network. 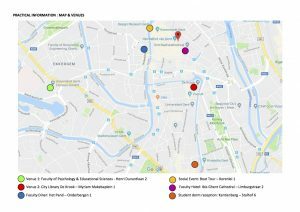 You can get anywhere in and around Ghent by tram or bus from early in the morning to late at night. 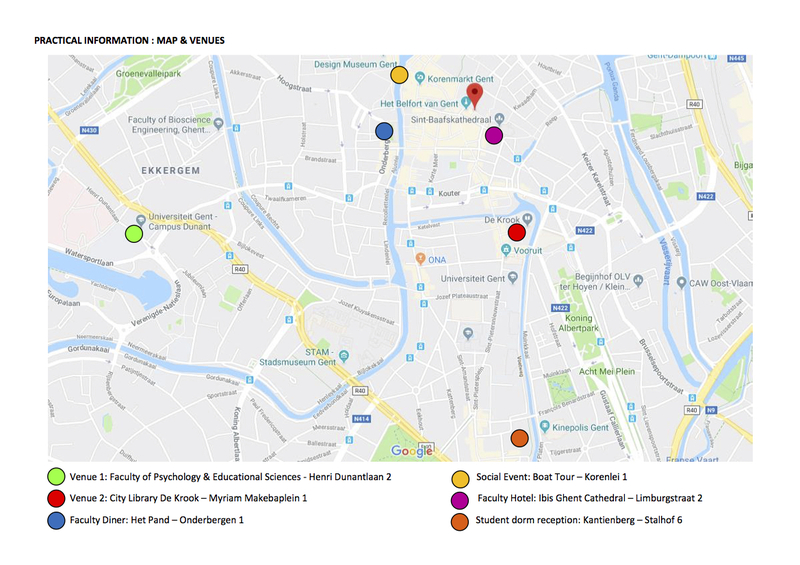 The conference is hosted at The Faculty of Psychology and Educational Sciences located at Henri Dunantlaan 2, 9000 Ghent, a little bit outside the historical city centre. It is, however, easily accessible by public transport. We will welcome you at the main enterance of the faculty building. – Tram 4, 21 or 22 to the Bernard Spelaan stop. The walk to the Henri Dunantlaan 2 takes 8 minutes from both of these stops. It is also possible to walk (approx. 25 minutes from the city centre and approx. 30 minutes from the student dorms). See more detailed information about public transportation, tickets, bikes, taxis, directions, maps, and more here. Click here to see map in full size. Ghent is close to three international airports. From each airport there are bus and train services to Ghent. Most regular airline services are offered via Brussels International Airport. Most of you coming by air will arrive at Brussels Airport. During the day, at ten to each hour, there is a direct train to «Gent Sint Pieters» (direction «Gent – De Panne»). You can check train schedules at http://www.b-rail.be/main/E/ – Click on National and use “Brussels Airport” as departing station, and «Gent Sint Pieters» as the destination. When arriving at Brussels Airport, just go to the lowest level (-1) since the railway station is below street level. You can buy your ticket to Ghent («Gent») at the desk. Choose exit «Gent/Antwerpen» on the E40 (Oostende – Brussel). Follow direction: «Gent-Centrum». See more detailed information about travelling to Ghent here. 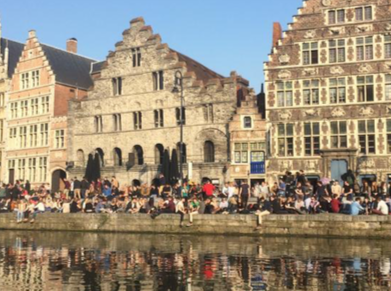 According to Lonely Planet, Ghent is «Belgium’s best kept secret». The city is located in the Flemish part of Belgium. With its 250 000 inhabitants it is the capital and largest city of East Flanders. The city nearly equals Bruges when it comes to the number of museums, canals and bars. It offers a larger variety when it comes to contemporary art, theatres, and concert halls. Much of the city’s medieval architecture remains intact and is remarkably well preserved and restored. Its centre is also the largest carfree area in Belgium. Attending the IRW – and thus visiting Ghent – you should see the medieval Gravensteen Castle, the belfry, the cathedral with the famous painting of the brothers Van Eyck «The adoration of the Holy Land», the St. Nicolas Church, the three beguinages and the monasteries. 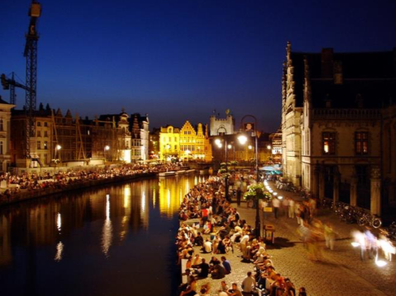 There are plenty of well established hotels in the heart of Ghent near the University. The University itself is dispersed throughout Ghent, Belgium with buildings near its historic center as well as its modern outskirts. Feel free to reach out and ask the committee questions regarding the university or about the city itself. Ghent University is one of the major Universities in Belgium, consisting of 41 000 students and 9000 staff members. Founded as a Latin-speaking State University in 1817 by William I, King of the Netherlands, it is a relatively young university. After its independence in 1830, the Belgian State was in charge of the administration of Ghent University and French became the new official academic language. In 1930, Ghent University became the first Dutch-speaking university in Belgium. The Decree of 1991 assigned great autonomy to the university. Over the years, eminent scientists such as Joseph Plateau (physicist, considered as a pioneer in the development of motion pictures), Leo Baekeland (inventor of Bakelite), and Corneel Heymans (Nobel Prize winner in Medicine) studied and worked at Ghent University. Today, after decades of uninterrupted growth, Ghent University is one of the leading institutions of higher education and research in the Low Countries. Ghent University is an open, committed and pluralistic university with a broad international perspective. Ghent University offers high-quality, research-based education in all academic disciplines. Today, Ghent University attracts over 28,000 students, with a foreign student population of over 1,100 EU citizens and some 1000 students from non-EU countries. 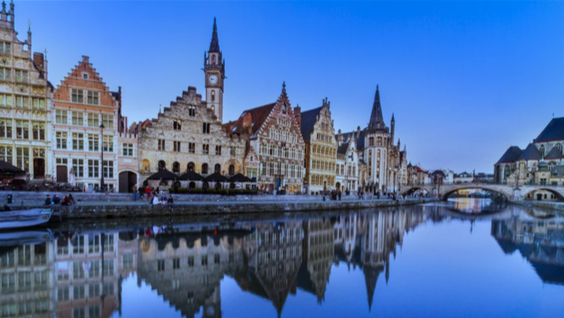 Located in Flanders, the Dutch-speaking part of Belgium and the cultural and economical heart of Europe, Ghent University is an active partner in national and international educational, scientific and industrial cooperation. It consistently rates among the top universities not only in Belgium but also throughout the world.